Note: This option is only available for cameras with System Software version 3.00 or later. 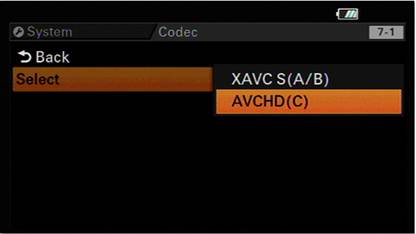 Please follow the procedure below to change the recording format to XAVC S or AVCHD when using Memory Stick or SD Card media. 1. Press the Menu button on the camera. 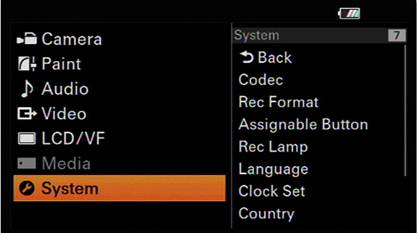 Scroll down button to select System and press the SET button. 2. 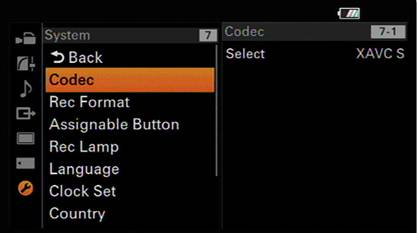 Under System menu, scroll down to select Codec and press the SET button. 3. Under Codec menu, click on Select. Options will be displayed. 4. 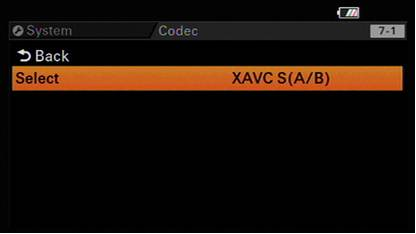 Scroll down to select either XAVC S or AVCHD (C) and press the SET button. 5. Select Execute and press the SET button to confirm. 6. 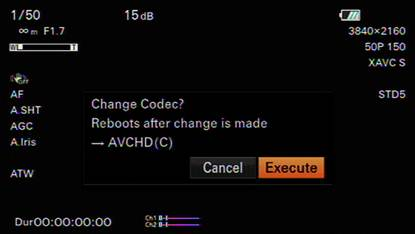 To verify, go back to System menu and select Codec, the selected format is displayed.